During the Second World War New Zealand maintained an extensive coast-watching network. The navy had operational control, but coast watchers included civilians and members of all three armed forces. Stations were established throughout New Zealand, including the Chatham Islands and the Kermadecs. They extended south into the sub-antarctic Campbell and Auckland islands, and north to Samoa, Tonga, Fiji, the Cook Islands, Tokelau, Pitcairn and Norfolk islands. Coast watchers were also placed north of the equator on Fanning Island and on the Gilbert and Ellice Islands (now Kiribati and Tuvalu). Some stations were operated by locals, others by operators sent from New Zealand. On inhabited islands local people provided much of the information on enemy movements. 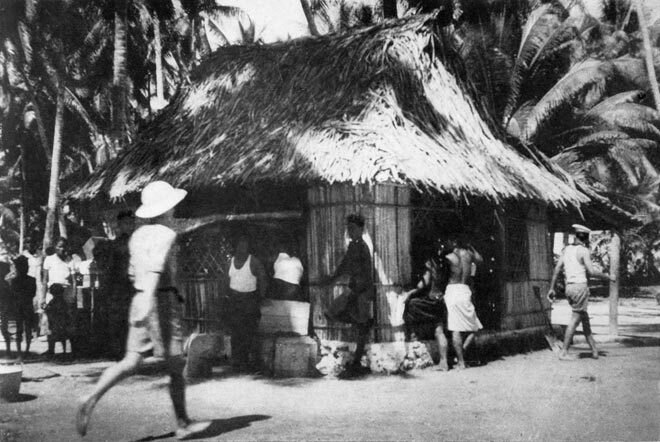 Seventeen New Zealand coast watchers, along with five civilians, were executed on Tarawa (the capital of Gilbert and Ellice Islands) after it was invaded by Japanese forces. Eight of the coast watchers in the Gilbert Islands were made prisoners of war by the Japanese; one died while held prisoner. Reference: D. O. W. Hall, Coastwatchers. Wellington: War History Branch, Department of Internal Affairs, 1951. My father included this name when he listed the places where the 2nd Marines landed in WWII. I think now maybe he just liked to say the name. He was with the 2nd Tank Battalion. Any information would be appreciated.